Meet your English speaking Chauffeur in the lobby of your hotel. Detailed visit to the Royal Palace. Description: This is a half day private panoramic tour of Madrid and a detailed visit to the Royal Palace. On this private tour you will get an overview of Madrid with a Panoramic city tour where your guide will explain about the sites as you pass by them. Then with your private local guide you will take a detailed visit of one of Madrid's most emblematic monuments, The Royal Palace, which looks on to the beautiful Plaza de Oriente sqaure. 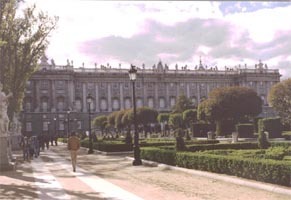 The Royal Palace was built on the site of the old Alcázar, the moorish castle destroyed by fire in 1734. It is surrounded by the beautiful Sabatini and Campo del Moro parks. The palace itself contains furniture, tapestries, paintings and ceramics as well as other important works of art and frescos by Tiepolo. English-Speaking Official Guide in for duration of the tour.